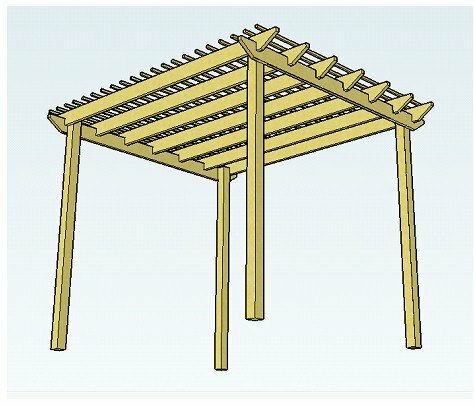 So...you want to build a pergola and you want to build it now! It should be relatively easy to build, shouldn't it? If you are anything like me, you have an idea and are itching to get on with it the moment the idea pops into your head. You have the interest and enthusiasm, and your motivation is on fire! Great!! Don't let these small details put you off. 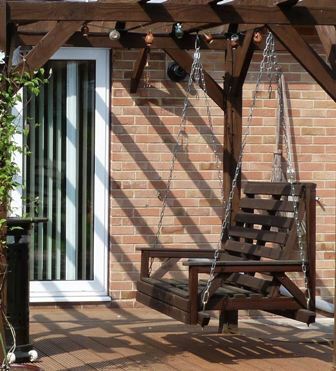 Once you know which size bolts to use and the length of wood you'll need - or where to find the pergola kit you're dreaming of - it's fairly plain sailing. You could easily have one of these gorgeous features in your garden in no time at all. 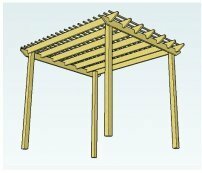 The free plans are intended to show beginners how to build a pergola - from getting ideas, finding tools and materials, and last, but not least, easy step by step construction, creating a low cost, beautiful, free-standing wooden garden feature to enjoy for many years to come. Building one of these wonderful structures can be very satisfying as well as great fun, and you definitely won't need an engineering degree to understand the plans! Need really simple plans, with very little cutting and notching? There are two styles to choose from. Both can be built very quickly - maybe even in an afternoon! 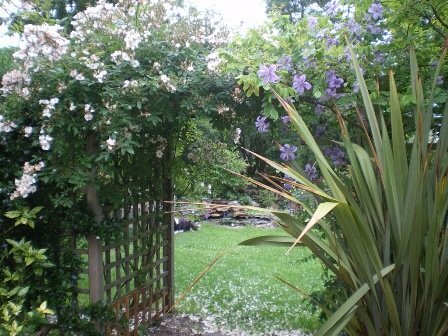 Imagine how proud you'll feel when you show everyone your creation... and imagine your sense of achievement when you see your arbour clothed in wonderful, fragrant climbing plants! "We are very impressed by your plans and motivated to build our own. We are impressed at your magnanimity in making such accurate plans freely available for everyone. We like the idea of the corner design which would really suit our garden needs and were wondering when plans for this might be available for sale. Many thanks." The example design is just that, an example, with easy to change elements to suit your own unique style preferences and situation. Simple or elaborate, large or small, build it as you wish! The plans will still work for any shape or size, even if the look is significantly different - using thicker wood, making rafter tails longer, changing the shape of the structure and the decorative rafter tail ends, having rafters running in only one direction and closer together, using a raised rafter style, or having rafters sitting fully on top of the supports. There are so many things you can do. See Adapting The Plans for more ideas and details. There are additional plans that you can use, too, all with free rafter tail templates. 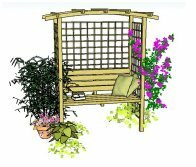 These plans were created as bespoke structures for people who asked for specific plans to create a pergola they really wanted in their garden. Most can be made by adapting the principles used in the free plans. Some of us, however, need a little more help with building these more unusual designs. Each contain detailed building instructions for that particular style - simple diagrams and pictures - making DIY construction a breeze... and they all come with 18 free rafter tail templates. Take a look at the stunning corner design, with it's wonderful radiating rafters. 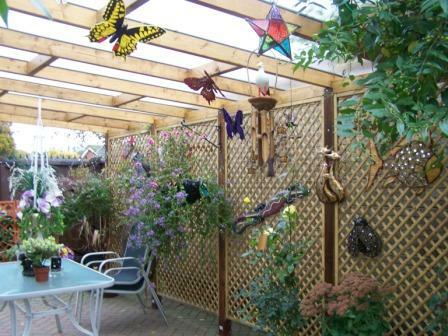 The attached lean-to pergola can be used on a patio wall, as a porch, carport or, more usually, a fantastic extension to the house. People love the hexagonal plans. There are so many interesting possibilities! Also available is an asian style structure with its beautiful curved rafters. 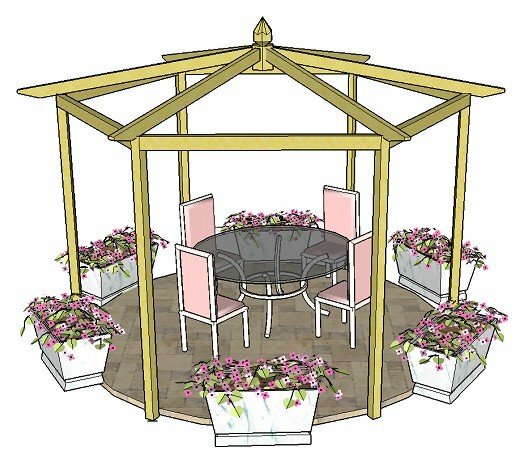 Make all sorts of different pergolas, arches or a heavenly arbour, using the arbour plans. And last but not least - fancy an arbour with an integral seat built in? - there's the beautifully romantic seated arbour, with either straight or curved rafters. 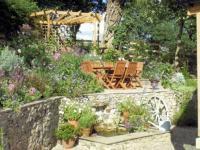 Wherever we would like to position these wonderful features in our gardens, we sometimes need to lay a patio, too, as well as doing the woodwork. Many people ask how to do this properly, themselves. 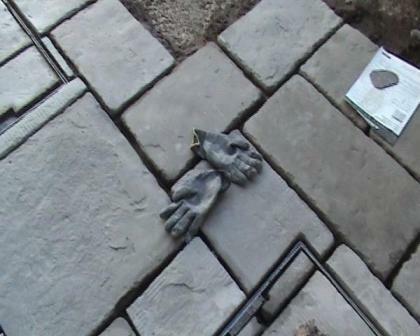 See how the professionals do it in this video tutorial, which includes digging out, drainage, covering unsightly drain covers, correct laying techniques, and pointing, ensuring that your patio stays put, and has no wobbly bits! The video comes with free supplementary notes showing how to calculate quantities, and other useful hints and tips to make sure your patio lasts for many years. If you feel that you would like all the cutting and measuring done for you, take a look at some of the wonderful pergola kits available in wood, metal and vinyl. There are so many to choose from that you are sure to find one that is perfect for your garden. Pictures can be a great source of inspiration. 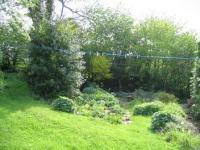 See 'Before' and 'After' images, and pictures that others have shared of the wonderful features they have built. These range from the very simple to more elaborate designs. Get ideas and advice on how to incorporate one of these fabulous features into your own garden. "I love your website! Your entire site is incredible. I was able to get ideas for my pergola, which looks fantastic. I will be more than happy to send a photo after we stain it..."
To give your feature a truly unique feel, choose interesting garden furniture and accessories to make your seating area a really special place to relax and entertain, maybe including a hanging chair, outdoor bean bag, furniture sets, loungers, lights, patio heaters - or even a hot tub! 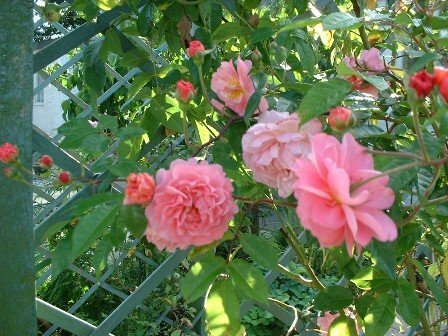 Growing climbing plants is so satisfying, and makes all the difference to your newly built structure - their beauty, fragrance and height will add an extra dimension to the garden - and fill your senses! 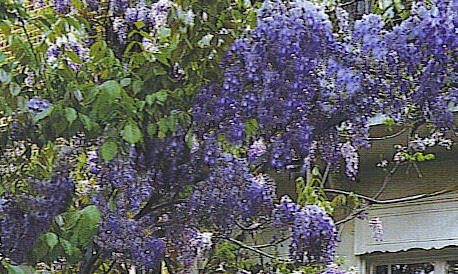 Find lots of ideas on which type of plants to grow, with advice on planting, care and pruning. So...prepare, build, and most importantly...enjoy! Are you ready to build the garden of your dreams?! Get hints and tips, offers and advice on all things gardening with the 'Love Gardening' Ezine. Just fill in your details and away you go! Your first ezine will be with you shortly.